Be it clothing, jewellery or home décor, Chennai’s homegrown brands have enough to satisfy all your needs, whether classical, contemporary, fun or quirky. Brass Tacks is the ultimate destination for anyone looking for western silhouettes in Indian handwoven fabric. The collection embraces natural, indigenous textiles and weaves, and uses them as the foundation for well-cut, tailored, fashion-forward clothes. The brand’s muse is the ambitious, cosmopolitan Indian woman. “Indian” is key; Brass Tacks recognises the need to look beyond standard size charts and is sensitive to diversity of body type and shape. Expect jamdani dresses, khadi dhoti pants, linen jumpsuits, boxy phirans, and stylish saree blouses. A niche jewellery label, Roia features collections of nose pins, pendants, handcuffs and earrings. Marketed as “wearable luxury,” the pieces take inspiration from nature and architectural forms, and are made using copper, brass, silver sheets and tubes, wire, patinas, resin, fused glass or semi-precious stones. The resulting jewellery has an edgy rustic-chic boho vibe with its minimal geometric forms, pops of colour and contemporary design aesthetic. The best part is that you can be certain you’re wearing a unique piece of art; each item is one-of-a-kind and rarely repeated or reproduced unless specifically requested. Roia retails at Maalgaadi and Tamara in the city. Chennai, we know, is synonymous with leather. Combining a contemporary, minimalist aesthetic with traditions of fine craftsmanship, Hydes Studio makes use of the city’s resources by creating artisanal leather goods. Hydes has a very modern design sensibility – simple lines and form that is married to function. With a collection of totes and slings, each meticulously designed and handcrafted by skilled local artisans, the brand makes for a pleasant change from mass-produced goods. Most importantly, its business ethic is rooted in sustainability with their raw material and hide sourced responsibly and with as little damage to the environment as possible. Customers can pick from a range of colours and finishes. Whether you’re looking for colourful, chic totes, shoulder bags, cross-body bags, wallets, or even the oh-so-convenient organiser, Madras Motifs has a wide range to choose from. Think smart bags featuring Mashru with Kantha embroidery, roomy Ikat totes, and clutches that celebrate the much-loved Madras Checks. The fabrics do most of the talking, but there’s always a little quirky element that breathes life into the piece. Think Chennai and big, bold traditional gold jewellery can’t be far behind. Tvameva, with its array of imitation jewellery crafted to perfection, has fast become a popular destination for all bling-lovers, including brides seeking affordable options. By celebrating traditional and antique design ideas — from the Hyderabadi Guttapusalu and the Tamil Kaasumalai to temple jewellery, imitation kundan and the Kerala Pichimottu – Tvameva seeks to create pieces that will become heirlooms. The brand particularly embraces the royal vintage aesthetic, and going by its near-30k Instagram following, customers love it! Initially a city-based art and lifestyle platform, The Postbox has expanded in scope in the three years of its existence, and now designs its own range of products. Known for products that combine tradition, functionality and a contemporary aesthetic, The Postbox takes its inspiration from the various cultures and regional and indigenous craft of India. 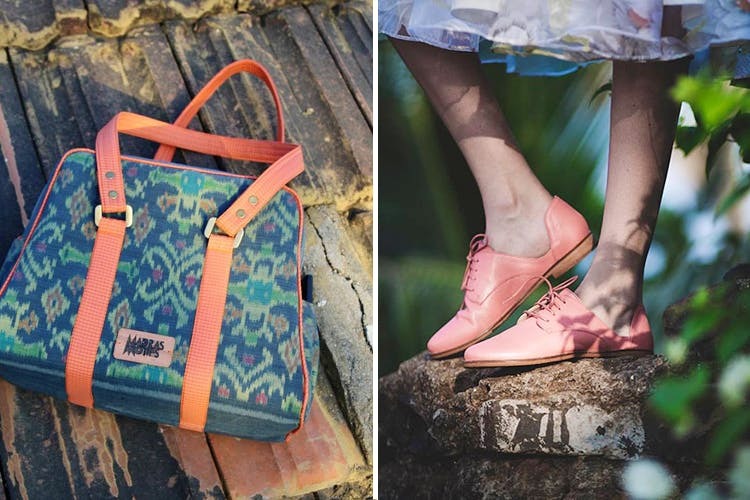 Whether it’s through their painstakingly created Travel Essentials line, or their much sought-after leather and ikat laptop sleeves and bags, the brand’ promises an intimate reconnection with the handicraft and handloom sector of the country. They work directly with artisans and weavers from all over the country. If you’re a fan of handcrafted leather footwear, VAPH is a must-visit. Founded upon a leather legacy of several generations, the brand uses modern design techniques, resulting in shoes that meet global fashion standards. The brand is particularly loved for the comfort the shoes offer, and the fine attention to detail. The brand is also willing to customise shoes for clients. Choose from brogues, loafers, mules, moccasins, and even boots for both men and women. They also have a collection of tasteful travel bags.